There have been many county cricketers whose longevity has been matched by an impressive career record yet whose appearances at the highest level might have been better rewarded. Chris Adams is one such cricketer: with almost 20,000 first-class runs, a considerable presence and the man possibly best remembered for taking Sussex to their first county championship and indeed making it three in five years, his is an interesting story. Chris Adams was born in Derbyshire where he started off his career and his future took him to Sussex as captain, Surrey as manager and he was close to taking on the lead role as supremo at Yorkshire. Although newly-selected England players might have been watching their backs in the 1980s, matters had improved by the late 1990s but not perhaps early enough for Adams to keep his place after a difficult tour of South Africa in 1999. Coming in on your debut at 2 for 4 – the English way of putting the total not the Australian! – was perhaps not ideal... His frustrations around this time at a further chance for international recognition become obvious. As Grizzly My Life and Times in Cricket details, not everything has inevitably always been sweetness and light. Inevitably, there have been difficulties along the way but, what impressed me most about this book, is the style in which it is presented. There is criticism but it is, for the most part, constructively and fairly put. It is also modestly written and comes over well. His views of his time at Surrey are perhaps more trenchantly told but it is nice to see the civil way in which some events have been put. After years where it was generally felt that the talent Surrey had should have led to better results, possibly Adams’s efforts and influence set them back on the way taking them back to the First Division and two Lord’s trophies. Having been through the, at times, turmoil of boarding school, I was intrigued by his appraisal of his time at Repton School. Having thought that fagging had gone out by the time he went there towards the end of his schooling career, many of similar vintage to myself may find his thoughts quite interesting. It may strike a chord but must have made a favourable impression as he and his wife have sent their girls to Repton. Sussex’s first County Championship trophy in 2003 rightly deserves a good of deal of space although I might have expected slightly more coverage of the latter wins in 2006 and 2007. Throughout, the facts on the pitch are mentioned in detail and appear meticulous and Adams does not shy away from some of the more negative events throughout his career. As always, though, the style is fair and the book, to me, reads well for it. The effect of some of the international cricketers with whom he has shared changing rooms is mentioned in good detail and Peter Moores’s influence comes over well. Tragedy has hit both the Sussex and Surrey sides with which Adams was involved. Umer Rashid was drowned in the Caribbean in 2002 trying to save his brother and, more latterly, Tom Maynard’s death is still keenly felt. Adams recounts both tragic episodes with understanding, great sympathy but in a balanced way. 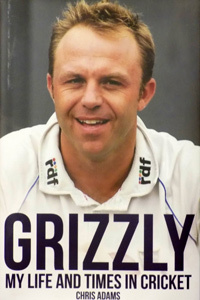 All in all, I found Grizzly an excellent, fair and readable account of this hard-hitting and confident batsman and I would urge people to read it.